Poetry is alive and well at the Homewood Center, Howard County’s alternative school. I know this to be true because I am Homewood’s Media Specialist and for the past 10 years, with the support of HoCoPoLitSo, I have been able to host poetry workshops in my library. Students who attend Homewood have not succeeded in the comprehensive school environment. Poetry gives these students a safe and therapeutic way to express themselves and exposes them to the power of the written word. The transformative power of poetry was never more apparent than earlier this year when HoCoPoLitSo’s Writer-In-Residence, Joelle Biele came to our library for a visit. From the moment that she greeted the students with her calm spirit and razor sharp intellect, she engaged them in a different way of thinking. With so much emphasis in school curriculum on STEM related subjects, students are rarely given the space or the time to think creatively. Ms. Biele began her presentation by literally opening the space in the room with a Youtube video of Sandhill cranes migrating. 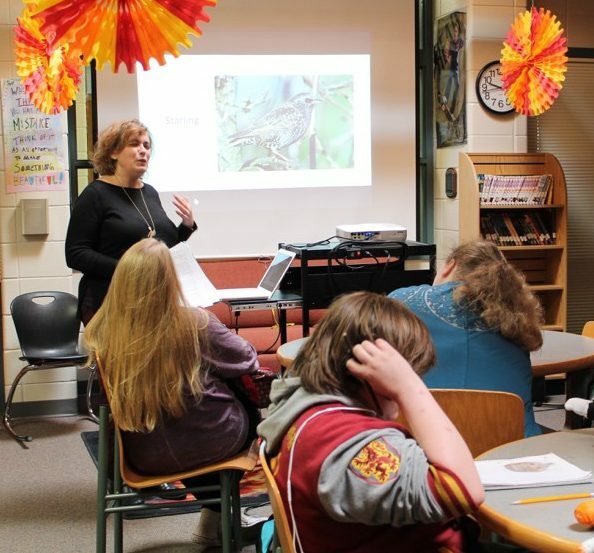 The peaceful images of cranes in flight gave our students a moment of Zen and the background knowledge that they needed to understand her poem, Autumn. Ms. Biele challenged our students to think about what it means to write and the types of writing that they do in their daily lives. Is a text writing? Can a Facebook post be poetry? And from where does a writer find his or her voice? Students were also asked to respond to the prompt called “I am.” Such an important question for every young person, and perhaps even more important for the struggling learners at Homewood: Who Am I? Who asks students such questions and who cares about their answers? The answer is loud and clear: poets! For many of the students at Homewood the time spent with Ms. Biele was their first encounter with a poet, but hopefully it won’t be the last. By Laura Yoo in Uncategorized on March 12, 2018 .